Happy Peppy People Who Are A Little Bit Too Happy and Too Peppy for Their Own Good. What are these Happy Peppy People doing? They are being the spokes models for the Ray Coniff Orchestra with every fiber of their being. ‘S Connif too, with a companion volume, although in no sense a sequel to his bestselling “Wonderful! This time the music is moodier, and the arrangements a little more subtle . . . Subtle, yes well . . . I mean what could be more subtle than fully clothed pole dancers? Or maybe they’re fully clothed people hugging gigantic pencils? Either way, it’s subtle alright. 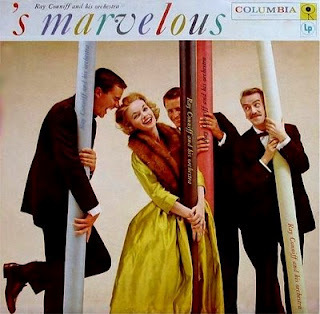 In fact, it’s Subtle Marvelous or Smarvelous, if you will. Oh look! These adorably diminutive Happy Peppy People who have just been run out of town on a rail are the New Christy Minstrels! Not to be confused with the Old Christy Minstrels who the New Christie Minstrels bound and gagged and hid in the backstage closet. 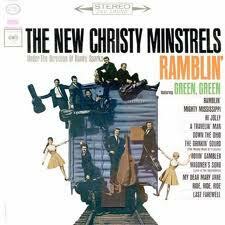 Of course, the New Christy Minstrels are now, themselves, the Old Christy Minstrels. Not to worry, scientists knew this was going to happen and have been working ‘round the clock since 1972 to prepare the new ones. They are hoping to have The New Christy-Clone Minstrels ready in time for Christmas. 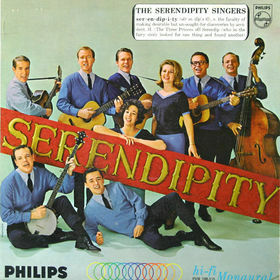 Here’s some Happy Peppy People who named themselves Serendipity. This is a group of fun-loving singers who are awaiting their chance to bind and gag the New Christie Minstrels and stash them in the closet along with the Old Christy Minstrels so they can replace them both as the New Most-Improved Christy Minstrels. Talk about Serendipity! It’s a good thing he sings with power too because somebody seems to have stolen his microphone . . . shhhh . . . don’t tell him though, there’s no reason to ruin the time of his life. I think you need to get some 90s grunge in the mix there Linda. That music is way too happy. Good idea Rob! My first cousins are the Screaming Trees, so maybe they’ll grant me an interview or something! 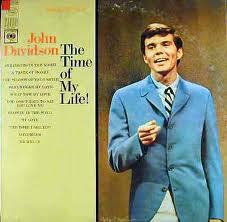 Is that the same John Davidson who hosted That’s Incredible at the end of the 70s/early 80s? Yes he’s one in the same. Little Johny Davidson never really found his niche. Good remembering — was it google-free? Hahaha it took about two minutes for “Lice the Hairy Menace” to hit me. I guess my synapses are a little slow due to attending the Faux Guap Memorial today! I thought I saw you at the Memorial – you were doing the face decorating with the pink sharpie, right? My parents has these. Because of repeated listenings, I will be allowed to skip purgatory. Yes I made up every single one of them, HF! I was up all night modeling the Happy Peppy People out of clay and then photographing until the sun came up. And I’m so glad you liked the John Davidson fellow. I was especially proud of how he turned out. All joy to you to William Harper Lee Falkner! I’m so old I remember the New Christy Minstrels when they were really new and we had that very record in our collection. Thanks for the memories. The New Christy Minstrels – Ramblin’ OR Gamblin’? Looks like they’re about to fall off that caboose and break their necks. Haha Lisa! There isn’t anything they wouldn’t do for their art! Not only do I remember all these (my folks had all of them..) I remember Christy Minstrel, even before she was New, when she was still Christy Billingsly, a small brunette with a big voice from Minneapolis… she used to sing for tips at the local watering holes, and was considered to be a bit promiscuous…. but, she was younger then…. So, I’m curious… What do you use as a preservative when you store those Happy Peppy People on your shelves? I like to use Bee’s Knees ointment, but some folks prefer Vaseline… how about you? If you don’t use anything, they lose a lot of their Peppy….. which can lead to losing their Happy, too, and then what good are they? Except to wrap up old columns in to throw away…. 🙂 Welcome to Monday… and thanks for starting it off so charmingly weird…. Hahaha Ned! You’re in fine form this Monday morn. Actually interrupted reading Gigoid to read your comment. So yeah, this is kind of a weird morning. But it’s a little alarming to think that WordPress (or Weirdpress?) is acting strangely. It was acting up while I was composing the post as well. Then I thought what if something happened and my blog just disappeared. Then I thought I better make darn sure I have copies of everything. Wouldn’t it be horrible to lose hundreds of hours of work. So I know what I’m going to be doing today! Sigh . . . But better safe than super sorry. Loved the Christy Billingsly Story LOL! Ok, back to reading Gigoid! I’m laughing at the 6’2″ blue eyed “young” baritone who hasn’t realized his microphone was stolen by the NEW Christy Minstrels. These albums look like they came straight from a Christopher Guest movie. Well I’m slowly amassing a very eclectic vinyl collection. One of these days I’ll have to buy a turntable! True. Unless you count “Might Wind” which is the hilarious spoof of folk singing groups Christopher Guest made awhile back. It’s great fun and the music is all written by Guest and Michael McKean. Everyone is just so Happy, and you just have to love the way it is all advertised, I just love it. You know what? That’s a really good point, Mags. People were so happy and sweet and uncomplicated. Yes you have to love it don’t you? I still play that NCM album, but I can only hear the scratches. I knew the Main Street Singers in A Mighty Wind were channeling somebody’s sweaters, but could never think who– thanks for clearing that up! Hahahaha! ahhhh! Mark! Well, first of all you can have my album. It’s in mint condish. You’re right about the sweaters! Writing this post made me want to watch Mighty Wind again. And I think I remember hearing something about the JD dimple disaster. When they found the troup they reported that they were scared but happy as all get out as well so everything turned out Ok . . OF COURSE!! I guess the happy peppy people movement has passed. Well, possibly . . .probably!